When you have less, you want more. Especially when you have less time or, in my case, less space and sun in which to grow vegetables at home. 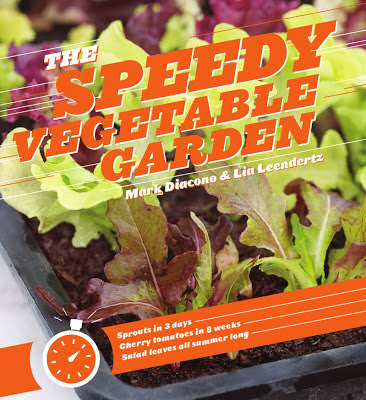 So I was excited to receive The Speedy Vegetable Garden, a new Timber Press book about veggies for the impatient or time-squeezed – but also for the sunless and spaceless, like me. After the first few pages, I was already planting a garden in a nylon sockette. Yup. I’ll tell you why in a minute. British writers Mark Diacono and Lia Leendertz cover a lot of ground (ho ho). Amongst their first speedy tricks are sprouts, which you likely know about, and soaks. Soaks? Are you intrigued? It’s the act of soaking seeds overnight to trigger the germination busy-ness inside that makes them more nutritious and ready to feed a young plant. Or you. Overnight soaking, even I have time to do. So I zipped over to my local Better Bulk to pick up raw sunflower seeds and almonds to try soaking, and organic chickpeas to try sprouting. Encouraged by Diacono and Leendertz, I discovered that soaks are easy-peasy. You need the seed of your choice, a bowl, water and a good night’s sleep. By morning, my plumped almonds and sunflower seeds were ready. We ate them on cereal, in salads or with yogurt. After soaking, the chickpeas were ready to graduate to sprouting. Keep in mind, I have no spouting tray, nor the official-looking sprouting bag that Leendertz notes large seeds like chickpeas are ideal for. But I was impatient. Looking for an odd sock which I thought might do the job, my eyes latched onto a stockingette. Even better – not only could I rinse my sprouts in it, I’d see the results. Invention is the necessity of mothers. Set in a bowl in a dark cupboard, and rinsed every 12 hours, the chickpeas sprouted beautifully in my makeshift sprouting bag, and made a great salad addition. 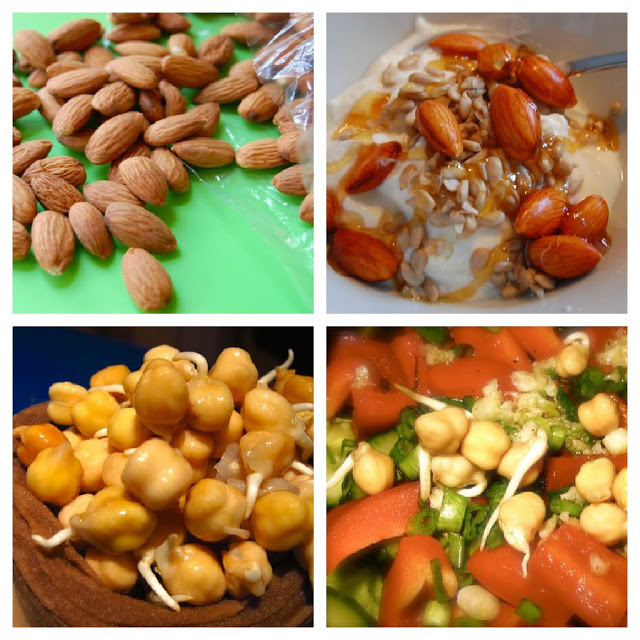 My speedy vegetable experiments (clockwise, from top left): raw almonds; soaked almonds and sunflower seeds with yogurt and honey; sprouted chickpea salad; and the chickpea sprouts in my stockingette sprout bag. Yes, it was clean. Sprouts and seeds are only the beginning. Diacono and Leendertz cover how-tos on trendy microgreens, or harvesting the earliest leaves from a diversity of seeds. Salad greens, the perfect veggie for us shady garden types, are given good coverage. And the authors also go through better varieties of standard garden vegetables, from tomatoes to turnips. It’s all paired with recipes, such as the chocolate beet brownies that still have me going Mmmmmm in anticipation of beet season. In the Greater Toronto Area, our growing season – the number of frost-free days – ranges from 150 to 170 days (or a bit more in the hotter inner city). Not bad, really. It compares well to many areas of the UK – although, of course, Toronto’s winters are harsher. Despite being by British authors, much of the advice in The Speedy Vegetable Garden applies to us quite nicely. While I wouldn’t call this a dense read, it is a quick and inspiring one. As you can see by me. Loved that you blogged about this. So well written and yes, so enthusiastic!!! Can you advise how long it took to sprout the chickpeas? Your stockingette was a perfect idea! You know, I read there is more value in a sprouted seed than the eventual grown plant. I wonder if that is true? Thanks! I like that the sprouts are paired with recipes. Bren, the instructions in the book were pretty much spot-on: three days for chickpea sprouts after the initial 12-hour soaking. You could let them go a day longer, depending on how sprouty you like them. Afterwards, I rinsed them again, drained well and put them in a covered container in the fridge. They stayed good for at least a week, although the root tips became a little less crispy. Helen..found it today at Chapters, only two copies left!! Now only one. It is a great book, just great. Thanks again. Am definitely doing the fresh sprouted chickpea hummus. Glad you were inspired to sprout from reading this book. Year round vegetable gardening in a small space is definitely as simple as growing sprouts on your kitchen counter top. I think because it is so easy to do, most people don't bother. 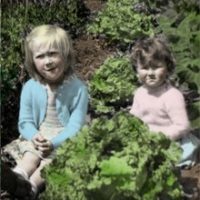 I have been sprouting for many decades. Please… always use certified organic seeds and nuts to sprout. I'm not sure if you used certified organic sunflower and almonds nuts when you sprouted the nuts. I also highly recommend the Easy Sprouter. This makes sprouting very easy and clean. I always have something sprouting…broccoli, red lentils, mung beans, red clover…I also grow black oiled sunflower sprouts. This is trickier, because after a small sprout has formed they have to be placed on a seed tray of organic soil. Then grown under lights until they are about three inches high. All seeds and nuts should be pre-soaked and the amount of time you have to soak the seeds is determined by the type of seed. Many small seeds should only be soaked for about 4 -6 hours. Larger seeds are soaked overnight. Thanks for your tips, Lorraine. Is it the Easy-Sprout you recommend (the one that looks like a soft drink cup)? It is called the "Easy Sprout" and it does look like a soft drink cup, but it is actually a dual container that uses heat from the sprouts to circulate fresh air by convention. The inside cup has holes at the bottom. I rinse my sprouts twice a day: once in the morning and again at night. Once they are sprouted place the container (and sprouts) in the fridge. I have been down many roads of sprouting methods and I love the Easy Sprout because there is never any mold issues. Sprouts hold a huge nutritional punch that is very energizing. Simple, locally grown goodness even in the dead of winter. Super, thanks. Looks like it costs around $15, making it very affordable. Easy Sprout sounds good and a good price. Will check it out too. I've gotta get sprouting! I actually bought a sprouter made from a Mason jar at a Seedy Saturday. It's got a piece of window screen on the top for air and for adding the rinse water. Must dig it out. Great to see you're inspired! Ooh you're most kind 🙂 Have a great weekend!